13 Things was my largest contribution to the 2015 Burton.com redesign. The overall goal was to create a unique digital experience that blended brand and e-commerce to push the sell-through of our product. 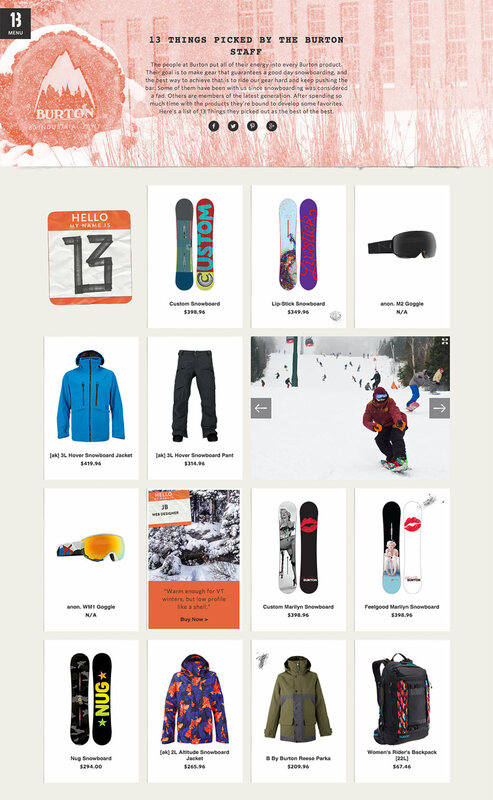 Weekly posts with a dialogue told a story while displaying 13 products, each including their own unique hover state with the ability to add to cart right from a quickview screen. Additionally, for each post designers would create a custom 13 as well as a duotoned header banner to create a unique look for each post and allowed us to have some fun. Below are a collection of my favorite posts and 13s that I worked on throughout the season. 13 Things even picked up some traction in the e-commerce world and you can read up on Get Elastic and Barrel NY. This project was created in collaboration with Julie Toth - Sr. Designer, Daniel Munzing - Supporting Designer, and Evan Rose - Creative Director. Lead image above was taken by Dean Blotto Gray - Principal Photographer.